Biker Match UK for about 7 years has been linking riders living in the UK with other biker singles for relationship, friendship, or to just have fun. If you are a motorcyclist living in the UK, you can learn about motorcycle events, ride-outs, rallies and news around you from this biker dating site too. Biker Match UK is both a dating site and a social platform, so if you are hoping to find a partner for a romantic relationship and biker dating or you just want to make friends and have fun, you will get the best of both worlds even with interesting features. It is free to join the site but you need to upgrade your membership to enjoy unlimited access to the features. It has quite a large number of daily visitors and an active user-base. Members on the site either have their own bikes or are motorcycle enthusiast so you can be sure everyone has something in common, passion for Motorcycles. 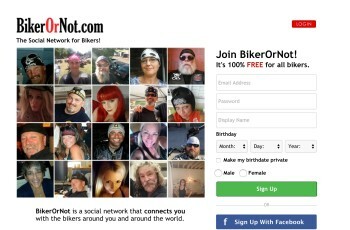 It is free to join and create a profile on Biker Match UK. At the point of registration, you will provide your real name, username, password, email, birthday, your gender and the gender you seek, how you heard about the site, and you will specify if you wish to receive newsletter from the site or not. After your account has been registered, you can build and modify your profile. You will be able to add more detailed information about you and you can add your photos too. You can also browse through the profile of registered members, view their photos, and reach out to them for fun or for romance. With the advanced search tool, you will be able to make specific searches, like searching for people living around you. It has a simple UI design and a good layout that is easy to navigate. It has quite a number of daily visitors and an active user-base. Access will be denied to Biker Match from outside of the UK to protect its members from malicious activity. You need to upgrade your account to remove adverts and enjoy unlimited access to the features. It is more of a social platform than a dating site with very limited features. Subscription payments will not be refunded if you have used your account for more than 10% of the subscribed period. On Biker Match UK, you will get to meet several biker singles that shares the same interest in motorcycling with you. The site runs biker dating services and is also a social platform with interesting features tailored to meet the needs of all biker enthusiasts. As a registered member on the site, you can create a profile, upload your photos, send and receive messages, join forums, read news and follow events. The site claims to offer the services for free but members are required to upgrade their account at an affordable fee. This gathered funds will be used to run adverts and promotions for the site to gain more members. With an upgraded account, you will no longer receive adverts and you will have access to some extra features. If you are a motorcycle rider that lives in or around the UK and want to meet biker men and women that shares the same passion with you for a relationship, friendship, or to just have fun, Biker Match UK is for you! If you want to follow motorcycle events around you and join other riders in forum discussions, you should check this biker dating site out too! You can create a detailed profile and upload several photos to your profile. You can send and receive messages from other members. You can participate in forums and you can check for motorcycle events around you. You can check into other members’ profile and view their photos. You can add friends you are regularly in contact with to your “favorite” list. You can use its advance search engine to make specific searches on members.